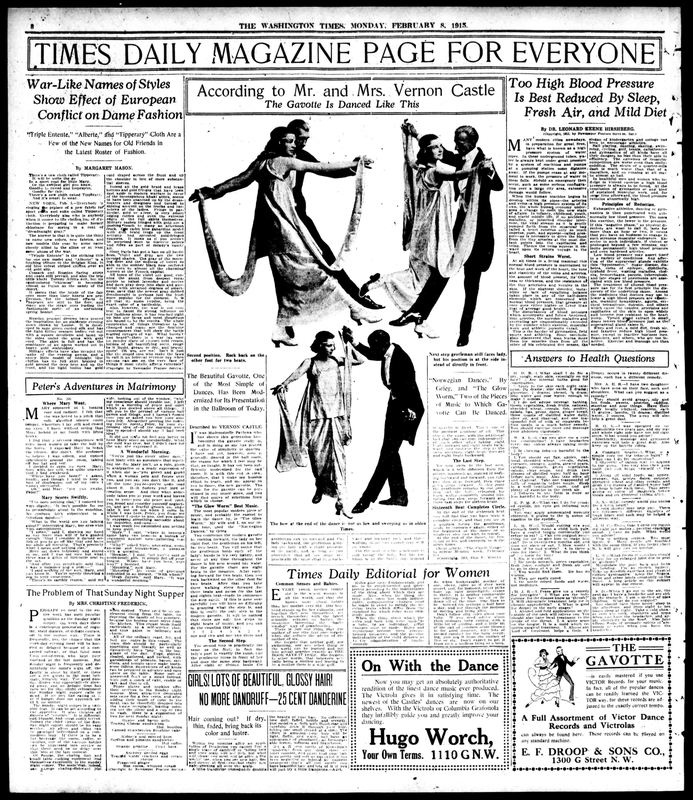 Like the Polka discussed the previous week, Mr. Castle acknowledges that the dance is past its prime, stating, “it has not been sufficiently modernized for the ballroom. It is with this end in view, therefore, that I make my humble effort to teach, and my appeal to you to dance, the new gavotte.” He suggests the song “The Glow Worm” as an ideal selection, but notes that he and Mrs. Castle danced also to Grieg’s “Norwegian Dances” during their previous tour. According to Mr. Castle, the Gavotte is not danced in the normal partnered hold, with the gentleman’s arm around the lady’s waist, but rather with arms outstretched, barely touching. The basic step occurs in sets of 8 counts. Starting on first foot (gentleman’s left, lady’s right), the couple rocks forward (1-2), backwards (3-4), three walking steps forward (5-6-7), and pause on 8. “The second step is practically the same as the first; in fact the lady’s part is exactly the same, and the gentleman turns in front of her and does the same step backward. After eight or sixteen beats the gentleman can go forward and the lady backward, the gentleman guiding the lady with a slight pressure of the hands, and as long as you remember that all the steps are practically the same (that is, a backward and forward rock and three walking steps) you cannot very well go wrong. For the next step the gentleman is still facing the lady, but his position is at the lady’s side instead of directly in front. This is one of the prettiest positions of all. This step is the same, with the additional fact that you can turn independent of each other after taking eight beats forward and eight beats backward and continue (?) the step is the same direction, eight beats forward and eight beats backwards. We now come to the last step, which is a trifle different from the others, inasmuch as, instead of rocking backward and forward, you take two slow steps forward, then three quick steps forward. At this point the gentleman remains in one position and the lady, releasing his hand, walks completely around him, taking two slow steps forward and three fast steps for sixteen beats. At the end of the sixteenth beat you will find that you have made a complete circle and that you are in a position facing the gentleman, ready to commence again, either at the beginning of the dance or at whatever step you wish to repeat. The Washington Times article reproduced above was provided by Chronicling America. The featured photograph of Vernon and Irene Castle dancing the Gavotte was provided by The Library of Congress. Although the Library of Congress states that it has not evaluated the rights status of the photograph, it lists the publication date of the print as July 29, 1914, which would place the picture in the public domain.